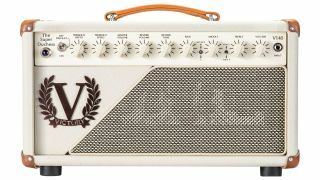 NAMM 2019: When UK amp firm Victory released the Duchess V40 into a feature-packed market back in 2014, its single-channel, single-valve simplicity struck a chord with roots, blues and classic rock purists who prefer to do their tonal sculpting with pedals. Victory followed it up with the Heritage Series V40 Deluxe combo and head in 2017, adding valve-driven spring reverb and tremolo. Again, it found a receptive audience. Now, for 2019, Victory is releasing a supercharged, more powerful iteration, the V140 Super Duchess. It's a 100-watt amp aimed at players who want more power and headroom for even bigger clean tones. Two additional 6L6 power valves and a beefed up transformer deliver the extra grunt for more depth, clarity and definition, while there's an all-new long-tank, valve-driven spring reverb and an additional, newly voiced Mid Kick switch option – now three-position instead of two – to add even more upper midrange focus and cut. Yet plenty of scope in drive. Bold, high-headroom cleans to touch-responsive classic overdrive. Hit it with pedals, or crank it and control from the guitar. Voice 1 is closer to a mid-’60s-type American EQ response.Voice II is subtly stronger in the mids for more punch and drive. You may prefer either with different guitars. Works with the middle EQ pot for two additional levels of stronger, more focussed upper mids, either clean or driven. 1 is a subtle kick, 2 is more strident and projecting. A long-tank reverb tray offers a huge wash or just a hint.The tone control makes it bright and springy, or warm and dark as you prefer. Perfect for subtle moody ambience or staccato rhythmic phrases. Wonderfully evocative with plenty of ’verb added! 100 watts high / 30 watts low. Sits between pre and power stages, completely out of the circuit when bypassed with a rear panel switch. No need to fiddle inside the amp when you change output valves. Dual-button switch supplied, or any latching TRS switch / control function will work. The V140 head will hit stores in February with a list price of £1,549/€1,699/$1,829.